Getting referrals is one of the most powerful marketing tools that you have in your marketing tool box. 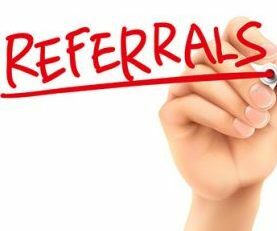 Referrals should be an essential part of your business and seen as an easy win. Think about it, you have gone to all the effort of getting some clients… I hope that these clients are starting to get some amazing results! They should be happy… They should think you are amazing, a person who is making their dreams come true. If this is the case then why would they not share the amazing job that you are doing with their friends and family. So how do you make a referral system work? You can bring your friend to one of our sessions. I will do a free consult for your friend. I will offer x% off a package for your friend. The most important part of the whole referral system is thanking the referee. This can be a simple thank you, but I like to doing things a little better than that. If a client refers another person who ends up booking I would treat my client to a gift… one that is personal to them. So for your movie addicts I would give them a set of cinema tickets, for a foodie I would give them a voucher for a healthy food place, really we are looking for something individual that is just for them! By saying thanks and recognising the fact that a client has put themselves out to help you grow your business and spread the word of health and fitness, this lets the client see you are truly grateful for their effort. If a client feels this they are much more likely to keep referring into your business. By having an effective referral system you are turning your client base into your marketing department. If your not doing business by referral start today and see the benefits of this cheap and easy way to pick up new clients. Think of how you are going to ask for a referral, literally! I would develop a script, something your happy with saying. Practice, it should come to you naturally. Have an offer, think of what your offer will be for the prospective client and also the referee. Remember this is ultimately the multiplier effect. You are taking the clients you have and multiplying it! EASY!